Budo Ninjutsu is doing with the body, doing physical work. Although Martial art helps us develop and maintain strength, power, speed, physical and mental health and ultimately becoming fierce warriors, most of these fade in time. We can only hope for “somethingâ€ to accumulate over time. This sediment presents itself to us under the Japanese mantle: Do. Simply put, Do is the Way, the Path, and the path requires work. At the end what remains is the “Do”. What this means for us is that the effort is lifelong. There is no “Kfitzat Haderech” here, this path has no shortcuts, although there will be times when progress will come in jumps, when small understandings will lead to bigger understandings. August 1999 was the last time AKBAN practitioners did sparring with a knock-out option. Ever since AKBAN instructors have been emphasizing full contact sparring with no injuries. A novice martial artist might think that a head punch with gloved hand is harmless and is not considered as injury – that’s a mistake! Many clinical studies support our old conclusion: even one major punch to the face raises the chances for post concussion syndrome, or Repetitive Head Injury Syndrome. Many martial arts forbid hand punches to the head, one can hit the body with great force without risking head injury – not so in our school. In Budo Ninjutsu we aim to spar in realistic, full-contact fights and we hit the face so that practitioners will get in the habit of defending the head area. Punching the face must be gentle enough even if boxing gloves are used. Our old conclussions gain crdibility from findings in other sports. The danger is not only old age neurological syndromes (Mohamad Ali) but near and immediate danger to the practitioner. AKBAN students that had a minor head injury, even while playing soccer weeks ago, do not participate in sparring that has a chance for head punching. To superb fitness we add correct sparring rules and etiquette, just so that we’ll be able to work in the Dojo for many years. Mr. K. writes about implementing evolutionary theory to martial arts and Ninjutsu practice. The Shaolin monastery has been rebuilt after it was demolished in the cultural revolution and is now the training place of a community of monks dedicated to Zen Buddhism and martial arts practice. The recent the death of a 17-year-old wrestler in a Sumo stable has forced the dismissal of stablemaster Tokitsukaze. The severe training methods of Sumo stables, especialy the beating and abuse aimed at begginers (“kiai-ire” – instilling spirit) have cost the life of a young Sumo trainee and cast light on the ancient training methods. The police invastigation implicates number of stables and will further limit the small number of young trainees and the popularity of oneof the most ancient martial sports. One of the more interesting terms in the field of evolution is co-evolution, or, in other words, the evolution of different species that affect each other and evolve side by side. This field encompasses a wide range of species, having symbiotic, predator-prey or parasite-host relationships. The patterns in which these species affect each other received the term “Red Queen Hypothesis / Syndrome” (see reference number 1). This principle was first suggested by the evolutionary researcher L. Van Valen in the year 1973. It is derived from the story â€œAlice in Wonderlandâ€, in which Alice runs alongside the queen but notices that they are not moving at all. 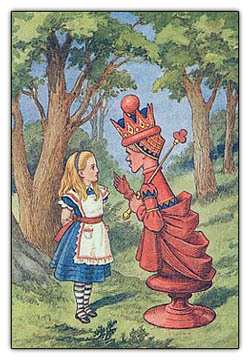 When Alice asks the reason for the phenomenon, the queen answers â€œYou have to run at full speed in order to keep standing still. If you want to get elsewhere, you would have to run at least twice as fast (2)â€. Van Valen suggested that if species a, which is in competition for resources or is the predator of species b, were to gain an advantage over his competitor, it would be able to push the other species from his niche, and in extreme cases bring about extinction. In response, so as not to be left behind, species b will develop means to deal with species a, and thus the two are caught in an â€œarms raceâ€. Such an arms race will bring about evolution and development in both species, focusing on traits that enable them to deal with each other, a development that would not otherwise occur. A common example for this phenomenon in nature can be found in predator-prey relationships: if the dove were to develop an ability to fly faster not allowing the falcon to catch it, the latter would have to develop increased speed as well so that its fitness is not harmed. In such an arms race, both species raise their flight speed yet their abilities in relation to each other remains the same. It is important to mention that evolutionary changes do not affect an individual but rather a particular group or population over several generations, and this change is passed on to offspring genetically. The development is expressed in a trait that a certain individual has attained, and if this trait increases its fitness, it may become an integral part of the population. However, when addressing the Red Queen Hypothesis and the arms race out of the biological context, it may be applied to other fields such as physics (3) and political science. I would like to apply this principle in the scholastic-developmental sense on martial arts in general and specifically on Budo Ninjutsu. In Budo Ninjutsu you learn constantly. In the beginning you learn the basis and perhaps a little too much. After a while, when things sink in, you learn new things or understand the basics in depth, this is learning as well. The veterans, from their many years of experience, can introduce new techniques and new forms, compare them to the existing ones and then break or leave some of the old. Every practice brings about new learning of technique, attention and dynamics with the training partner. At the end of each training session we test some of the things we learned in practice through Randori and sparring. Randori, which is combative in principle, enables us to test and apply the understandings from practice together with our training partner. When Randori becomes a little competitive, it places us on Aliceâ€™s running track facing our training partner. In order to remain better than my partner, I must outrun him. The competitive instinct, which exists in some of the trainees, pushes them to progress and learn, improve and work harder in order to better deal with their Randori partners. The difficulty which arises during Randori urges us to cope, and if the partner uses a new technique on us we will try to learn it, as well as its counter, so as to be more prepared the next time. This is a non-genetic arms race, but rather a scholastic and acquired race. In this arms race, just like any other, “not improving” means stopping progression. Often a trainee reaches a certain moment when she feels comfortable and able to defeat others with no effort. This can be followed the by a realization that she has rested on her laurels, some better opponent is the wake up call. Those who she had once easily defeated, now make her surrender, thus she (or he) is faced with two options: to run faster or to stay behind. Staying behind is not a bad choice for someone who is not competitive, but a competitive individual might despair and leave, for example. Leaving is analogous in martial arts to extinction. Running is difficult, uncomfortable, you have to learn new techniques and polish the old ones, you have to face the hardships after supposedly reaching the summit, yet this all leads to development, to evolution. This same principle applies to an individual and also applies to entire disciplines and schools in the field of martial arts. The need to preserve the traditional and existent knowledge is obvious, and it may clash with the need to innovate, refresh and update knowledge. A discipline that closes itself up for change, that stops innovating and progressing, leads itself to extinction. When is this apparent? Whenever the veterans in the discipline begin to leave and search for alternative places to train. Perhaps the most pronounced example of the Red Queen Hypothesis in martial arts is the competitive fighting arenas – UFC, MMA, Pride etc. In the beginning these were mainly composed of big strong men who beat up other big strong men. Along came the men of technique and showed the world different and much more effective ways to make men bigger and stronger than them surrender (for example the Gracie family). Several years passed and fighters from other disciplines were forced to learn Jiu-Jitsu in order to cope with the small man choking them from behind within a few seconds, and thus the wheels turn. In contrast to what happens in nature, evolution here is rapid, and its cycles can be seen every few years. Even inside the field of Jiu-Jitsu an arms race is going on, and we profit. Speaking of fighting arenas, the arms race occurs not only in a technical aspect but also when dealing with illegal substances. If my rival is pumped up on steroids, I would have to act as he does in order to beat him, and, when possible, through the use of more effective drugs. This is an arms race in which there are mainly losers. This phenomenon exists also in nature, when species compete with each other and the traits they acquire bring down their overall fitness: in the forest, for example, trees compete for sunlight; a taller tree is capable of receiving more light than its competitors. This causes the other trees to grow higher, thus creating a situation where the fitness of species “a” in comparison to species “b” remains as it was, yet both species invest more resources in order to reach the desired height and the overall fitness is compromised. The arms race exists also between the developers of illegal substances and those who are required to detect them, which is reminiscent of the arms race between parasites and their host (5), as well as within the immune system (6). The Red Queen Hypothesis can be applied to many aspects of our lives that contain an element of competition. This interaction with â€œcompetitive speciesâ€ leads in most cases to change and development, it makes us learn more and improve, it leads to a desire to practice better Ninjutsu. # Yoshihiro Haraguchi and Akira Sasaki (1996). Host-Parasite Arms Race in Mutation Modifcations: Indefinite Escalation Despite a Heavy Load? J. theor. Biol 183, 121-137. # Andrew F. Read (1994). The Evolution of Virulence. Trends in Microbiology, vol.3 no.2 73-76. The University of Berkeley (Cal),Began using the internet and video storage site of youtube to teach complete course programs. The Berkely UC is the oldest of the ten campuses affiliated with the University of California, and it is considered the flagship institution of the California higher education system. With Faculty staff of 1,950, 10,076 postgraduates and anual endowment of 3.34 billion us$ the university has so far placed more than 200 lectures on youtube. While we have much less in any department we modestly managed to put online in one year more then 1000 videos from different martial arts and we are working on the next 1000 articles, tutorials and martial art techniques for next year.